Every "touch" reinforces your relationships with your clients, employees, referral sources, even suppliers. Let them know you appreciate them and care about what is happening in their lives. We have a wide selection of gifts to acknowledge that new office, new job, new client, new baby, health recovery or personal loss. Business relationships have “life cycles” to them just as personal relationships do: new positions or office locations, new clients, referrals, retiring executives, and the occasions of a client’s or employee’s new baby, illness or personal loss. At HollyBarry House, we believe that all occasions are an opportunity for some gesture that acknowledges the relationship involved. Banded with our exclusive ribbon reading "Worth Your Weight in Gold", this gift is perfect for thanking referral sources, for appreciating understanding or patience, for welcoming a new account. 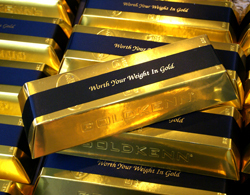 Contains 30 bricks of imported Swiss chocolates, each wrapped in gold. 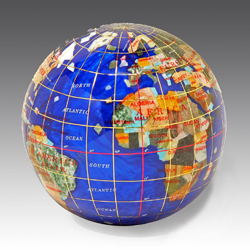 Wish your client a "World of Success" in their new offices with this paperweight. Inlaid with semi-precious stones such as lapis lazuli, onyx, mother-of-pearl, abalone shell and more. Available in two sizes and with background oceans in choice of lapis lazuli (shown), black onyx, mother-of-pearl or aquamarine. Longitude & latitude lines are either brass or silver depending on style. Elegantly gift boxed. 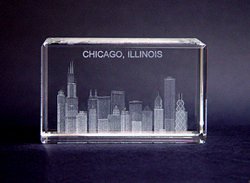 Welcome a visiting client or an employee trainee to your city with this 3-dimensional Chicago, Illinois Skyline laser-etched in lead crystal. Can be customized with company name and/or logo at modest additional cost. Varied sizes, shapes and pricing available. Phone for details. Also available: New York, San Francisco, Washington DC, Texas. To honor a special occasion such as retirement, this is a most unique gift. 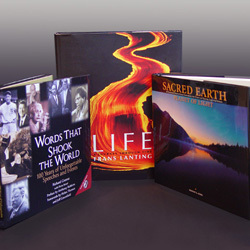 Present a beautiful volume of your selected book and have the title page customized for the specific recipient and bound into or tipped into the book. You craft the message to be included, add the name of the recipient, the date and add in your own (digital) photograph, company name and/or logo. Wide selection of titles. NO MINIMUM QUANTITY IS REQUIRED. 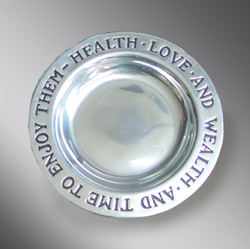 Featuring a classic saying "Health Love and Wealth and the Time to Enjoy Them," this is an ideal retirement gift. Measures 9.25"W x 10"L x 1"H. Made of pewter that never needs polishing. "What a nice presentation! (Name) was impressed with the great job you did for (recipient name)'s retirement basket....You displayed everything so well. Very nice!! That's why you're the best...I just wanted to pass along the compliments. Thank you so much." "We've been delighted with each unique creation… and the commitment to providing exceptional service is a customer's dream!" "Just a note to let you know our chairman, (name), passed away recently. I was told by his wife and daughter at the service that the book he received from the bank was a perfect gift. His wife has it on the coffee table and has thoroughtly enjoyed it...So thank you very much for choosing such an appropriate gift."